It’s hard out there for people who play with imaginary money. Bitcoin and other cryptocurrencies plunged over the weekend after it was revealed that a South Korean exchange, Coinrail, was hacked. Roughly $42 billion of market value was destroyed in the sell-off, and Bitcoin has lost over 50 percent of its worth since December. Bitcoin, the most popular cryptocurrency in the world, hit a record high back in December of 2017, reaching $19,783.06 in American currency. It currently sits at roughly $6,750 and to say that the market has been volatile would be an understatement. The price has fluctuated wildly since December, as you can see from this graph by CoinDesk. As Bloomberg News notes, one of the reasons that cryptocurrencies have been falling since December is that a number of hacks have made the news. Almost $500 million was stolen from a Japanese exchange called Coincheck back in January. And although South Korea’s Coinrail is a relatively small exchange, people are still trading on fears that the cryptocurrency system is inherently susceptible to intrusion. Coinrail, for whatever its worth, says that it keeps 70 percent of its cryptocurrency on devices that aren’t connected to the internet in what’s called a “cold wallet,” making them more difficult for hackers to reach. Another thing spooking the cryptocurrency market at the moment is China’s continued threats to crack down on illicit uses of cryptocurrencies, as well as “initial coin offerings,” ICOs. But some businesses in China are going full steam ahead with the Bitcoin craze, as companies like the Beijing-based Bitcoin miner and chip designer Bitmain are valued at as much as $40 billion. The U.S. Justice Department opened an investigation into cryptocurrency market manipulation back in May, joining forces with the Commodity Futures Trading Commission. But it’s unclear what kind of actions the agencies might take. Google and Facebook have both banned cryptocurrency ads on their platforms. Where does that leave Bitcoin enthusiasts for the second half of 2018? Nobody knows for sure, of course. But they’re just like any other traders at this point, if we’re being honest with ourselves: Dabbling in Monopoly money while the entire world burns around them. 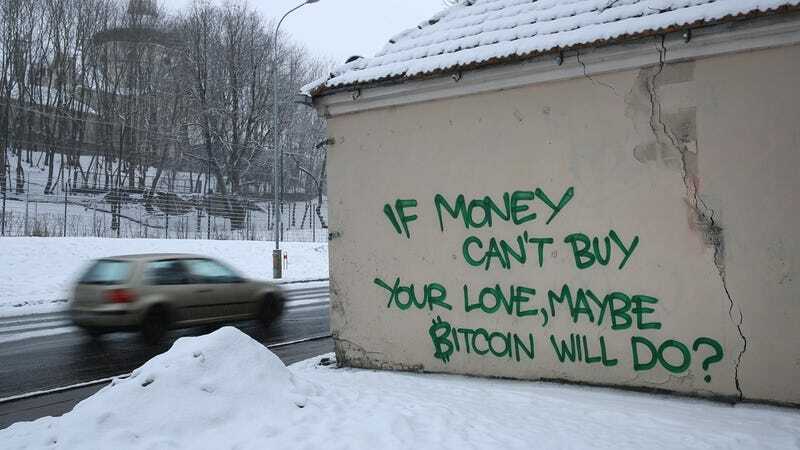 Hopefully you didn’t sell your house to buy Bitcoin back at the height of the market in December. Because whatever play-time money you had back then is worth less than half of that now.